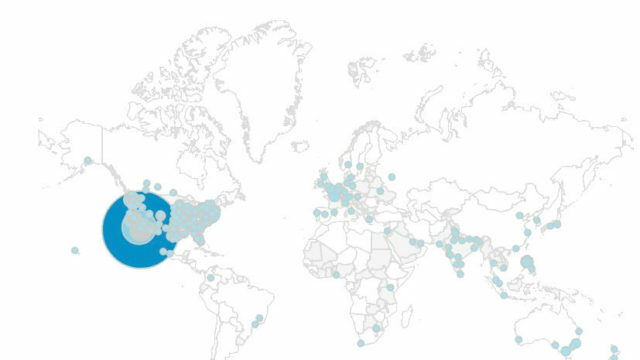 Map from Google Analytics shows location of Times of San Diego readers in June. Times of San Diego was read by 223,770 people in June, a 7 percent increase from the same month a year ago. The news articles that drew the most readers were a study ranking San Diego drivers as the fifth worst in the nation, the shooting death of a Navy officer at Horton Plaza and a local dance prodigy competing on America’s Got Talent. The independent news sites’ readers continued to be young, mobile and local. Millennials and Gen-X’ers, those between the ages of 18 and 54, accounted for 68 percent of reading sessions. The 35-44 age group was the largest, logging in for 21 percent of reading sessions. Smartphones were used for 55 percent of sessions, tablets for 9 percent and traditional desktops and laptops for the remaining 36 percent. Times of San Diego uses modern responsive web design to automatically resize for different devices. Some 47 percent of sessions were in San Diego County, and 9 percent elsewhere in Southern California. The balance of traffic was national and even international. Times of San Diego’s staff of seven publish two dozen articles daily covering all aspects of life in California’s second most populous county. The site is updated 24/7 and a free newsletter is delivered at 8 a.m. daily. The website is completely free and supported by local and national advertising and reader donations.